The eagerly awaited adaptation of J.R.R. Tolkien's colossal Lord Of The Rings trilogy, shot concurrently at a budget approaching $300 million, should be a bloated, hubristic disaster—the sort of project, like Cleopatra or Heaven's Gate, that torpedoes a major studio. But in the Tolkien spirit, New Line has wisely entrusted the Rings to a hobbit, choosing an unlikely leader in director Peter Jackson, whose previous credits include the micro-budget slapstick horror films Bad Taste and Dead Alive, and the masterful art film Heavenly Creatures. In the latter, two adolescent girls create elaborate fantasy worlds in their own backyard; so too does Jackson, who shot the trilogy in the lush, rolling greens and towering peaks of his native New Zealand, merging the stunning natural landscape with CGI wonders designed by his own special-effects house. An enthusiastic visionary set loose on one of the biggest playgrounds ever constructed, Jackson brings more personality to the series' first installment, The Fellowship Of The Ring, than typically seeps into a franchise of this magnitude. His light touch remedies many of the problems inherent in adapting the Tolkien books, which are heavy on exposition and light on structure, barreling from one scary encounter to the next without a sense of the grand design. The Fellowship Of The Ring may seem a little shapeless as a result, but it will probably look more complete once the other two acts of Tolkien's epic tale are put into place. 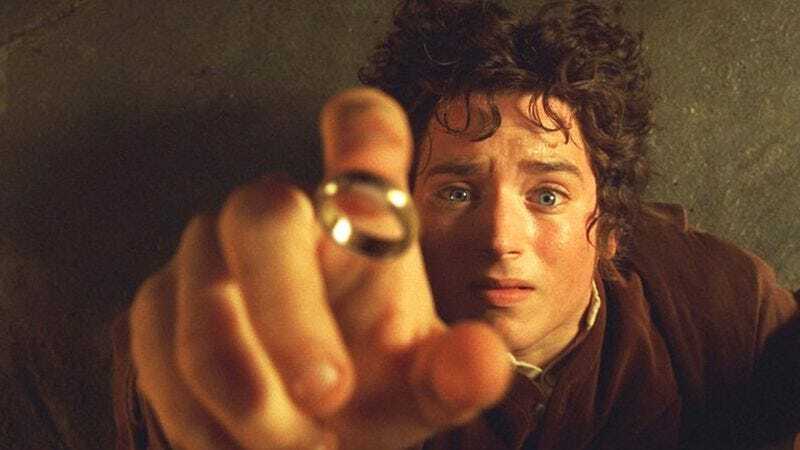 In the mythical world of Middle Earth, where the forces of good and evil are as boldly demarcated as on the Fox News network, an intrepid hobbit (Elijah Wood) has inherited a gold ring that his older cousin (Ian Holm) found on his travels decades earlier. Forged long ago by a dark lord looking to consolidate his power, the One Ring somehow slipped from its creator's grasp and eventually made its way to Hobbiton in the Shire, the furthest spot west of the lord's kingdom in Mordor. Wood's journey begins when a benevolent wizard (Ian McKellen) implores him to take the ring to the fires of Mount Doom and destroy it before it falls into the wrong hands. 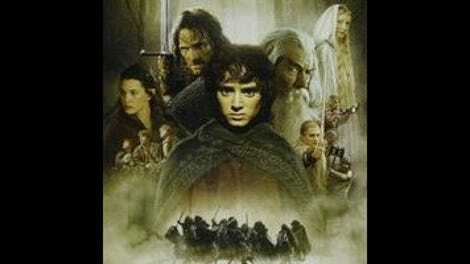 Facing an endless gauntlet of orcs, Ringwraiths, and genetically mutated Uruk-Hais, Wood is accompanied at various points by three fellow hobbits (Sean Astin, Dominic Monaghan, and Billy Boyd), two human warriors (Viggo Mortensen and Sean Bean), an elven archer (Orlando Bloom), and a roughneck dwarf (a scene-stealing John Rhys-Davies). In condensing Tolkien's book to feature length, Jackson and his screenwriters do the necessary pruning while still remaining faithful to the text. Pared down to its Cliffs Notes essence, the story moves forward at a relentless pace, occasionally sacrificing ambience for speed. But only the most expansive imagination could dream up a spectacle of such eye-popping proportions, with Jackson and his technicians constructing kingdoms and monsters with the innovation and joy of top-flight Ray Harryhausens. Setting vast digital armies against towering backdrops, the battle sequences have the visceral kick expected from the director of Dead Alive, as Wood and his motley militia hack through foes like zombies at the business end of a lawnmower. The Fellowship Of The Ring ends with a cliffhanger, but unlike the first Harry Potter movie, its rote annual competitor, it should leave viewers anxious to know what happens next.